The first thing I ought to say here is that it isn’t by that Charles Dance, the thinking woman’s crumpet; it is by the other one, and it was written in 1839. If you are not familiar with Meadow Run Press books, they are beautifully produced and this one is no exception. 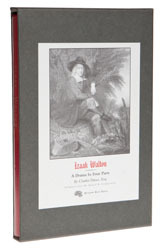 If you are a collector of Waltonia, read no further, because you must own this play; if not, I shall introduce you to the plot. As befits a good melodrama, young Arthur Graham, in pressing his suit for the hand of the beautiful Anne, a ward of Izaak Walton (who some of you may have heard of) runs into a bit of bother with some people who we would call travellers. Fortunately, Izaak nobbles the travellers, squares Anne’s mother, counsels the girl and the path of true love takes its course. Despite the fact that Arthur is called Venator throughout, there is precious little fishing, but I suppose he had his mind on other things. If you need this book, I am sure you already know about it, but there is another play about fishing by Rippier, called Fine and Far Off, which you might like to check out. Copies of the Meadow Run Press original are available fairly cheaply from dealers.